How am I investing in others? Leadership is not about titles, positions, or flowcharts. It is about one life influencing others. John has a passion. He wants you to be the very best you can possibly be. That is the mark of a true leader. A real leader wants others to grow into the best version of themselves. John is a master at this. 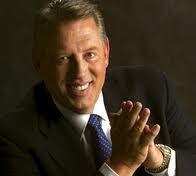 John Maxwell invests in others. He does it by writing books (50+ and counting!). He does it by speaking (to millions and millions). He does it by radio, TV, the internet, DVD, CD…you get the picture. How about you? How are you investing in others? Perhaps you haven’t yet written a book or been on TV. Maybe you don’t have a blog or a website or even a business card. But you can invest. You can become involved in a mentoring relationship. According to ancient Greek legend, a king named Odysseus went to war. He entrusted the care of his son to a close friend named Mentor. The word “mentor”, used to describe a wise and trusted counselor, thus became a part of our language. Mentoring is critical in the life of a leader. From King Arthur, whose mentor was Merlin the magician, to Timothy, who grew into a strong leader under the mentoring of the Apostle Paul, history is filled with story after story of mentors and protégés. Former Surgeon General Dr. C. Everett Koop was mentored by a typographer! There are two keys to every successful person. The first is that they have a mentor. A mentor is someone who helps sort options and identifies opportunities. A mentor gives advice and perhaps most importantly – perspective. The second key is to be a mentor. Every one of us can mentor someone. It doesn’t take a lot of money or even time. It basically means that you meet with them periodically and discuss what is going on in their business or family or life, and offer expertise, perspective and advice if asked. I have the good fortune of having several mentors. I have the great fortune of having several friends that I also mentor. And you want to know a secret? I learn as much from those I am mentoring as I learn from those who mentor me! 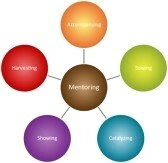 There are several mentoring models. Find the one that works for you. Traditional: In this model, there is a mentor and someone being mentored. Don’t have a mentor? Ask. You may be surprised to find that the person you most admire would be honored to work with you. Peer – to – Peer: In this model, each participant is a co-mentor. They work together, each bringing their particular skill set to the process. An example of this might be a sales expert in a Peer-to-Peer mentorship with an IT person. Each is in a position to help the other. Group: In the Group Model, several people meet. One of the popular versions of this is the Group-of-Ten in which 10 people meet regularly to discuss current projects, issues, and provide insight and advice. Pick a model, or try all three. The important thing to remember is that none of us are as smart as all of us. Investing in others is a great way to not only influence others, but we ourselves grow as a result. Who would you like to have as your mentor? Who are you currently mentoring? What can you do to begin a mentoring relationship within the next week? For a free copy of Keys to Effective Mentoring, send an email to Terry at terrydnewberry@bellsouth.net. This entry was posted on Thursday, November 10th, 2011 at 7:58 pm	and tagged with Advice, Business, Group-of-Ten, inspiration, John Maxwell, Leadership, Mentor, Mentorship, motivation, passion, purpose, teamwork, terry newberry and posted in Uncategorized. You can follow any responses to this entry through the RSS 2.0 feed. I’ve surf the net much more than a few hrs these days, along with your blog site was the coolest of all. A lot of many thanks an excellent offer it really is in fact useful to me. that applies to me as well! Absolutely! The strongest and most confident people are those who help others realize thier own strengths and dreams. Thanks for reading! I have struggled through out my life with the balance between the humility and often false humility adopted by many in the church to seem more Christ like and Godly confidence in the talents and gifts he has bestowed upon me. Recently a friend asked me if I had ever gone to a birthday party and given a gift I could not wait for the birthday boy to open… “Mine first!” I could remember those days when I was a kid. He said that gift was likely bought by your mother for you to give away, it was not for you. It was not your birthday. Talent is never enough. We should bolster it with the real humility of knowing from whence the gift came and for WHOM it was given. It came to me from the Almighty, but it is not mine to keep. It is rather like the five fold ministry: It is a gift TO the body of Christ and the lost who need to be found. Thank you so much for reading and for your comment. I agree, at its best, investing in others is an act of selfless service. Along the way, someone took the time and interest to teach me, and I in turn “pass the baton” by teaching others.